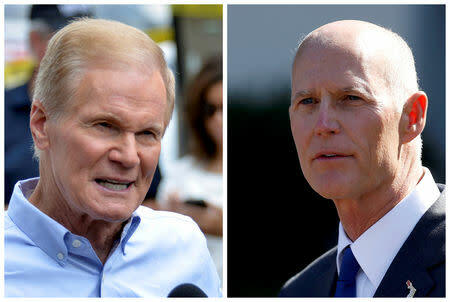 TAMPA, Fla. (Reuters) - Florida's bitter races for the U.S. Senate and governor appeared headed to recounts on Friday as Republican leads narrowed, and President Donald Trump vowed to send in lawyers in a development reminiscent of the state's dramatic 2000 presidential recount. As his lead dwindled in Florida's Senate race, Republican Governor Rick Scott filed lawsuits late on Thursday against Democratic election supervisors in two counties, accusing them of violating election law and demanding access to records of their vote tallies. Incumbent Democratic U.S. Senator Bill Nelson's campaign also filed a motion in federal court asking that provisional and absentee ballots not be rejected because election officials deem that the signatures do not match voters' signatures already on file. Trump accused Democratic election officials in the two Florida counties of corruption, without providing any evidence. Trump said he was sending lawyers to heavily Democratic Broward County. "All of a sudden they are finding votes out of nowhere," Trump told reporters at the White House, adding he believes Scott won the race "by a comfortable margin." Nelson's lawsuit, filed on Thursday, also seeks to extend the Saturday deadline for county canvassing boards to submit their unofficial results. Nelson said Scott was abusing his office by trying to stop a complete and accurate counting of all the votes. "The reason why he feels that way is obvious: we believe when every legal ballot is counted we'll win this election," Nelson said in a statement. The Florida contests, along with the races for governor in Georgia and U.S. Senate in Arizona, are the most high-profile races still to be decided after Tuesday's midterm congressional elections. Democrats won a majority in the U.S. House of Representatives after eight years in the minority. Republicans expanded their two-seat advantage in the Senate. The accusations and lawsuits in the political battleground of Florida conjured memories of the state's 2000 presidential recount, when the winner of the White House hung in the balance for weeks before the U.S. Supreme Court stopped the counting and Republican George W. Bush triumphed over Democrat Al Gore. Trump took note of the involvement of Nelson's lawyer, Marc Elias, a Washington-based Democrat who represented Hillary Clinton during her 2016 presidential race and has handled recounts before, including one that sent comedian Al Franken to the Senate from Minnesota in 2008. "Democrats sent their best election stealing lawyer, Marc Elias," Trump said on Twitter, promising to send even better lawyers to Florida "to expose the FRAUD!" Trump provided no evidence of fraud. The Florida Department of Law Enforcement said it will review allegations of criminal fraud but had no active investigations. On Friday afternoon, Nelson trailed by around 15,000 votes, or 0.18 percent, below the state's 0.25 percent threshold for a hand recount. In the Florida governor's race, Republican Ron DeSantis' lead had winnowed to about 36,000 votes, or 0.44 percent of the vote. The state conducts an electronic recount when the margin falls below 0.5 percent. Democrat Andrew Gillum's campaign said it was prepared for any outcome, including a recount. Another cluster of House races with votes still being counted could widen the Democrats' new majority, strengthening their hand to counter Trump's policies. The Senate race in Arizona between two U.S. congresswomen, Democrat Kyrsten Sinema and Republican Martha McSally, appeared days away from a final call with hundreds of thousands of ballots yet to be tallied. Sinema held a slight lead over McSally. In Georgia, where Republican Brian Kemp declared victory in the governor's contest on Wednesday with a narrow lead, campaign officials for Democrat Stacey Abrams have vowed to pursue litigation to ensure all votes are counted. Abrams is vying to become the first black woman elected as governor of a U.S. state. The Georgia contest drew attention because of Kemp's role as the state's top election official and allegations by voting rights groups and Democrats that he used his position to suppress minority votes. He denied the charge. In Florida, the recounts and possible legal challenges mean it could be weeks until a winner is determined in either race. Scott's lead has been steadily shrinking in the Senate race as the state's largest counties continue to tally ballots that were mailed in or cast on a provisional basis on Tuesday. Elias said Democrats historically tend to pick up votes in recounts, especially hand recounts. The lawsuit filed by Nelson and Democrats notes that "thousands of eligible Florida voters" could see their rights violated under the state's signature-matching requirements, citing research suggesting that ballots submitted by black and young voters are disproportionately rejected using that standard. Scott's lawsuits accuse Broward County Supervisor of Elections Brenda Snipes and Palm Beach County Supervisor of Elections Susan Bucher of mishandling the ballot count and preventing observers from having full access as votes are counted. Snipes and Bucher did not immediately respond to requests for comment. Scott also said he was asking the Florida Department of Law Enforcement to investigate. "I will not sit idly by while unethical liberals try to steal this election," Scott told reporters.